It’s rare that I receive a request for a recipe I’ve never heard of. 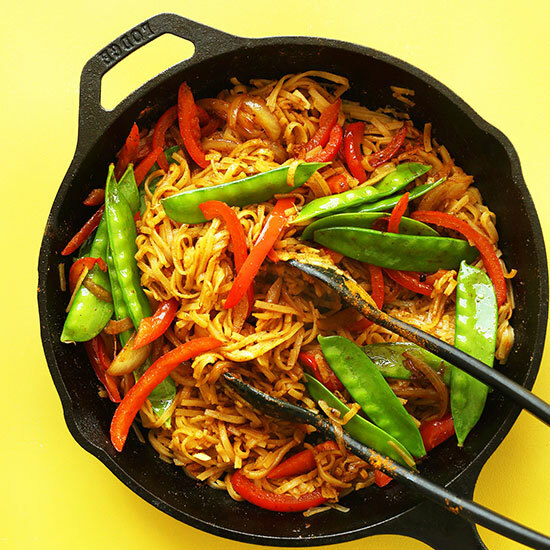 But that’s exactly what happened recently when a reader wrote in requesting I remake her and her husband’s favorite takeout dish: Singapore noodles. What? The description sounded amazing! How had I never known about this unique dish? After trying it for myself, I’m an instant convert. Drop what you’re doing, and get on board. Let’s venture into uncharted (delicious food) territory together! Singapore noodles isn’t necessarily a dish that originated in Singapore. I liken it to one of the many Chinese restaurant menu items I order that likely aren’t traditional Chinese dishes at all. It’s like a cross between curry and pad Thai. Its flavor comes from a tangy-sweet sauce + curry powder. Based on my research, there are some not-so-common ingredients in Singapore noodles like Shaoxing wine and fish sauce that I didn’t want to a) hunt down, and b) attempt to veganize. So I crossed my fingers, tried making it without them, and (much to my surprise) discovered you don’t really need them at all. With that being said, this is my inspired version. Since I don’t have an authentic version to compare it to, this might not match your favorite restaurant’s version. But, what I can promise is that this recipe is surprisingly easy, intense in flavor, and 100% delicious. While most of the recipes I found included pork or shrimp, I kept mine vegan by simply leaving these out. But I must say, the addition of my crispy, baked tofu adds extra protein and texture and takes this recipe to a whole new level of awesome. Keep this recipe on hand for easy, fast weeknight meals. I also think it’d be great for entertaining a crowd, especially if you have vegan and gluten-free friends. If you do try this dish, let us know! Leave a comment, rate it (once you’ve tried it), and don’t forget to take a picture and tag it #minimalistbaker on Instagram. We’d love to see what you come up with. Cheers, friends! Singapore Noodles simplified to just 10 ingredients and 30 minutes! Add tofu for extra protein and texture. The perfect satisfying, plant-based meal! In the meantime, make the sauce by adding minced garlic, tamari or soy sauce, coconut sugar, and lime juice to a small mixing bowl. Whisk to combine. Then taste and adjust seasonings as needed. You’re going for a savory-tart sauce with a bit of sweetness (adjust to taste). Set aside. Heat a large skillet over medium-high heat. Once hot, add half of the toasted sesame oil (1 Tbsp as original recipe is written // adjust if altering batch size), onion and red bell pepper. Sauté for 3-4 minutes, stirring frequently, or until onion is soft and translucent. Add snow peas, 1 Tbsp tamari or soy sauce, and 2 tsp curry powder, and stir (amounts as original recipe is written // adjust if altering batch size). Sauté for 2-3 minutes, then remove from pan and set aside. To the still-hot skillet, add remaining sesame oil (1 Tbsp as original recipe is written // adjust if altering batch size), cooked rice noodles, sauce, and remaining 2 tsp curry powder (amount as original recipe is written // adjust if altering batch size). 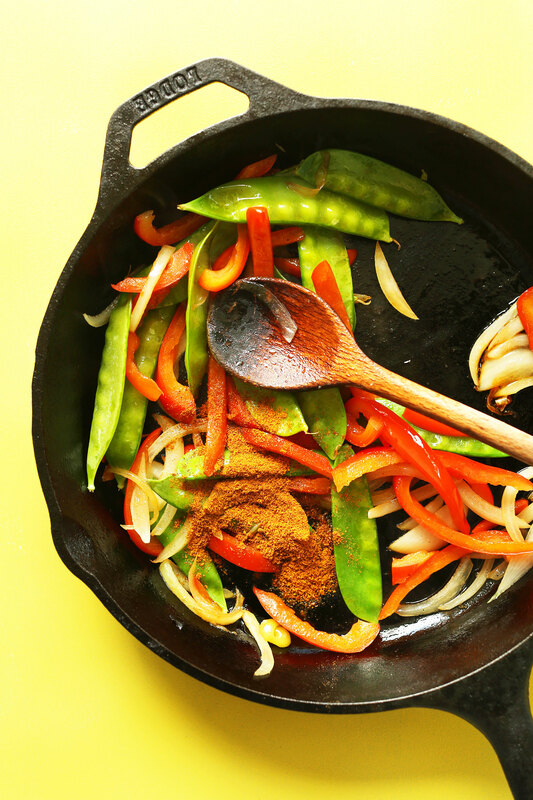 Sauté for 1 minute, tossing frequently with tongs to disperse sauce and curry powder. Best when fresh, though leftovers keep for 2-3 days covered in the refrigerator. Reheat in the microwave or in a saucepan over medium heat. *To add tofu, double the amount of sauce. Then pour half into a separate mixing bowl. Add 1 extra Tablespoon coconut sugar and whisk thoroughly to combine. Add pressed, cubed tofu to a parchment-lined baking sheet and bake in a 400 degree F (204 C) oven for 30-32 minutes, or until golden brown and crispy. 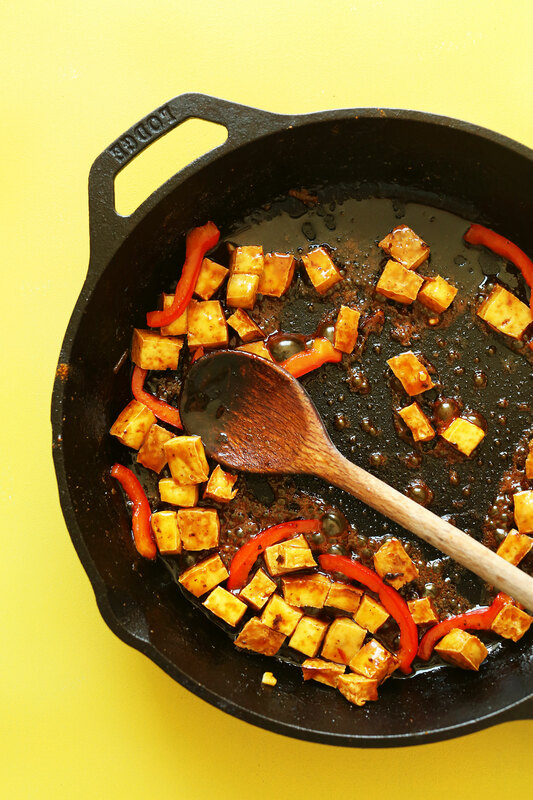 Before cooking the vegetables, add the tofu to a lightly greased skillet over medium-high heat and add sauce. Sauté for 3-4 minutes, stirring frequently, until sauce has absorbed and the tofu is very hot and somewhat glazed. Remove from pan and set aside, then continue with recipe as instructed. Add tofu back in with vegetables in step 7. *Recipe requested by a reader, and adapted from Serious Eats! *Nutrition information is a rough estimate calculated without tofu. Can we use regular sugar instead of coconut sugar? Delicious! I left a little of the curry powder out (about 1 tsp) since my young kids (3 and 5) don’t eat things that are too spicy and I wasn’t sure what the end result would be. Also topped it with some cashews for extra protein. They both loved it. My husband added Sriracha. Everyone wins! Yumzies!! I have made this and it’s somethjng we eat quiet often. I use edamame instead of tofu and actually added carrots. VERY GOOD!! Whole family loves it. I’m actually making it tonigh, too! Would love to know if you recommend a certain brand of tofu? I’m new to trying it and know nothing about which is a good one! Thanks so much!! This was absolutely delicious and a great alternative to my staple pad thai. I changed the sauce ingredients slightly (my version is non-vegan): 5 tbsp low sodium tamari, 4 cloves garlic, 1 inch ginger, 3 tbsp maple syrup (I used Trader Joe’s ghost pepper maple syrup), 3 tbsp rice vinegar, 1 tbsp fish sauce. I used very thin rice noodles (the Thai kitchen brand). Right after I stirred the noodles, sauce, curry powder and sesame oil together for about a minute or so, I added a scrambled egg to the side of the pan, let it cook for about 1 minute and then stirred it into the noodle/sauce mixture to make the noodles sticky like pad Thai. I will definitely be making this again soon! According to a manufacturer, potential hazards include violent reaction with water and the production of explosive hydrogen vapors upon contact with most metals; chronic (delayed) and acute (immediate) health hazards if inhaled, ingested, or contacted, including severe eye, flesh and skin burns or even permanent visual loss, inflammation of respiratory membranes, and corrosive burns to all human tissue. It may even be fatal if swallowed. Due to the vigorous reaction between the acid and water, such acidic drain openers should be added slowly into the pipe to be cleaned. 1 vegan fish sauce is amazing!!! Dried shiitake mushrooms and maybe some kombu and you’ve got that mega umami hit without the anchovies!! 2 when you say red peppers, do you mean a capsicum (what we call big red things that are kind of like chilli but not spicy at all in Australia) or a chilli (small and spicy) or do you mean red peppercorns? Will, we used to live in Melbourne, so I definitely know the answer to your question, although I’m a bit late. Just saw this recipe and will try it tonight. In the States, a red or green pepper or bell pepper is a capsicum. We have many colors, and they are not spicy. 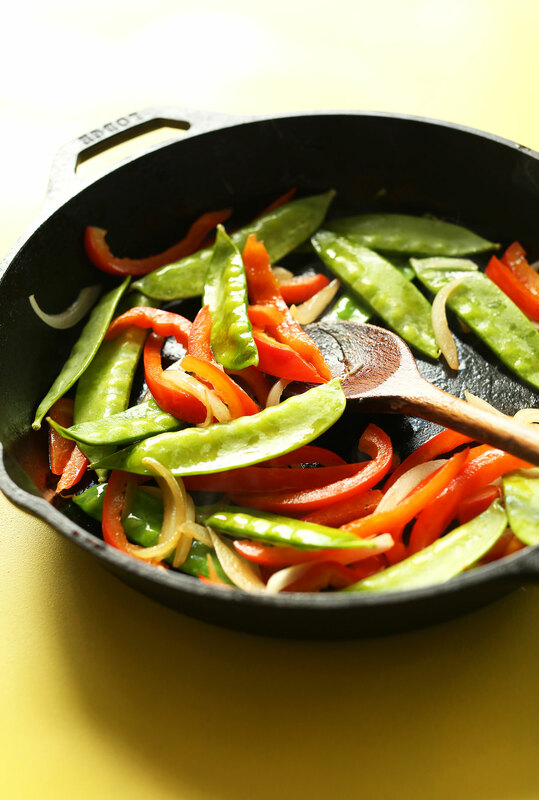 Usually recipes calling for a chili pepper would be spicy and more specific, like jalapeno or serrano pepper. Hope you tried the recipe and it was good. This is amazing! Added a little extra lime juice for tartness and sriracha to give it that extra kick. Will definitely make it again. Thank you for the recipe! I love this recipe so much, I can’t even remember how many times I’ve made it. I have loved singapore noodles since I was a kid and this recipe completely satisfies my craving. Thank you!!! I made this last night. It was a big hit:) thank you for another great recipe! Whoop! Glad you enjoyed it, Kat! Can you use tempeh instead of tofu? This tasted AMAZING! I didn’t have any sesame seed oil or snow peas so I replaced each with regular canola oil and a small aubergine, and it tasted divine! Absolutely my new go to stir fry! Great! Thanks for sharing, Francesca! I made this minus the noodles – with bok chop, mushrooms, leeks, tofu and edamame. It was really fantastic. Best stir fry I’ve made in years. 5 stars. Glad to hear you enjoyed it, Nicole! Loved this recipe! Tastes like comfort food to me. I live in Shanghai, China and these noodles taste better than any Singapore Noodles that I’ve found here! I skipped pressing the tofu before baking because I was short on time and it still tasted great and was nice and crisp on the outside. I love this baking method for the tofu! Fantastic! My husband just returned from a trip to Singapore and I decided to make this for the family as our first meal when he returned. Everyone loved it! I just finished cleaning my plate, this recipe was so good!! We used brown rice ramen noodles and coconut aminos instead of soy sauce because that’s whatnI had on hand. No idea how other people said it was tasteless because YUM!!! The tart or the lime with the curry… so good! So happy I found this in my weekly Minimalist Baker recipe search! ? I made this tonight and it was super yummy. I didn’t have peas, so I added in a ton of spinach. I also only plan fried the tofu as I was a bit tight for time. Overall, the sauce and the final product were really delicious. Easy to make and very versatile. Will definitely be making this again! I love this recipe. I have visited your food recipes several times now. I will be posting a picture of these noodles on my Instagram soon! Thank you Minimalist Baker for sharing a wonderful recipe. I have modified the recipe by replacing Tofu with cottage cheese (paneer). In addition, I also sprinkled Sesame Seeds when I served the noodles. Quick and tasty. Love it! I am from Singapore and this is one of those strange but funny dishes that we don’t have in Singapore. It is closer to the generic fried noodles one would find in a Cantonese restaurant or Chinese restaurant catering to tourists. The inclusion of curry powder is odd and perhaps more in keeping with Southeast Asian Indian-Muslim noodles. Ultimately, all Southeast Asian love their noodles and we are totally spoilt for choice because of the multi-ethnic heritage in this part of the world. I just made this and it was very tasty! Made this tonight for dinner with tofu. Turned out great. I like lots of sauce, so next time I think I’ll make a little extra. I made this last weekend and I really enjoyed it! My husband wasn’t a fan, but that’s because he doesn’t like curry powder. It was nice to have all the leftovers to myself. I forgot to add the sesame oil (I planned to add some just at the end for maximum flavor) and it was still quite tasty. I love this tofu preparation, it gets so much flavor and texture on the tofu. I’ll have to try it with different sauces to see how that goes.. maybe a Thai style curry sauce next time with some coconut milk. I found this recipe while searching for the coconut ramen, which I make on a regular basis. I’m Singaporean but I have never heard of Singapore noodles before. It looks good though and I’ll definitely try it out. Sooo delicious- love the tang and versatility! I’ve made this several times this past year and it’s been great for using up leftover veggies. Ohh it was delicious :) just cooked the tofu free version, and I replaced the veggies for Chinese cabbage, green bell pepper, and carrots (thinly ribboned); replaced soy sauce for liquid aminos, and the oil I used was coconut. The noodles were organic millet&brown rice. Anyways, the taste was real Asian, and I loved the idea of combining curry powder with Asian sauce. My husband also loved it, although he said there could be less lime juice (or more sugar) in the sauce. I just made and ate this delicious meal….I added pineapple which was incredible with the curry. I am very interested in the other recipes and look forward to trying them out this coming week. This is one of our favorite dishes at a local restaurant. My boyfriend and I made it last night. Oh my gosh, so good!! We were both extremely pleased with how it turned out and just as good as our local restaurant. Thank you! I make this so often in the weekends for lunch, and its so easy and delicious! I don’t have snow peas or coconut sugar, but I just substitute with other veggies and brown sugar. I’m not vegetarian, but I would recommend this to vegans or anyone who wants to try something different for a meal. Just made and it was really easy and yum. But super spicy! Did I do something wrong. I make these ALL THE TIME! Probably about 30 times since I first read found them. I’ll sub in different veggies, add chili and don’t double the sauce for tofu, just saute it in a little bit of oil and glaze with tamari or soy. So tasty. Feedback from a meat eating friend: They were Vegan and they tasted so good, might be the only Vegan thing I ever eat, well done! I must have done something wrong… mine wasn’t insanely delicious. It was kind of tasteless. Not sure where I missed the mark, and bummed because I was hoping these would be something like mee goreng. This recipe was wonderful, and we plan to add it to our regular rotation. We added some extra veggies, as we often do for recipes, and we marinated and baked the tofu. With leftovers, I made some broth with veggie stock, tamari, rice vinegar sesame seeds, and shatta (middle eastern hot sauce) to turn the leftovers into a soup. It’s awesome! So awesome that I felt the need to write this comment (I don’t comment much on things like this). SOOOOO DELICIOUS!!!!!!!!!!!! THANK YOU!!! THANK YOU!!! I used organic cane sugar, doubled the recipe at the last second and added broccoli. BEST MEAL! I made this the other night and I enjoyed it. My picky wife wasn’t thrilled with it because she said it was not flavorful enough, but ate several servings. I didnt have any lemon or lime and it was fine without it. Also, I used garlic powder because I (sadly) did not have any fresh garlic. Minimalist Baker for yet another win! I have a feeling I already know the answer to this question… but will this dish work without the curry? I stumbled across this site yesterday and this recipe sounded interesting. I ended up making this recipe last night and it was very flavorful and filling. Im not a fan of tofu so I skipped that ingredient. I also really enjoyed the extra kick from the garlic chili sauce! Thank you for sharing your recipes. I look forward to trying more of them. Fantastic recipe. I made this for dinner and me and my boyfriend were super surprised at how good this is considering the relative simplicity. I swapped out the peas for brocolli due to personal preference and it was great. I also opted to use the tofu and it was A+. I’ll definitely be adding this recipe into my rotation. Absolutely delicious! I followed the recipe exact, though my tofu is a bit tough on the outside and a little rubbery on the inside and not crispy at all? I took it out just as it was was becoming slightly golden and I followed the recipe to exact (I havnt cooked tofu before!) not sure if I did something wrong or if I can cook it a bit differently next time? I just made this, and it tastes amazing! Thank you for this recipe – I can’t wait to make it again. So delicious! I used liquid aminos instead of soy sauce and also added baby bok choy and green onions when adding in the snow peas. Also, I used regular sesame oil and it turned out great. I topped it with sesame seeds and red chili flakes. Thank you for another great dish, I have yet to be disappointed by your recipes. At what point do you add the sauce? Sooo good. I’m making these for the 2nd time this week! My go-to Thai place closed, I’m so glad to have found such a delicious substitute! I made this with tofu cooked in my Actifry for 10 minutes with a bit of sesame oil, and tomatoes instead of the red pepper. I topped it with a small amount of chili paste (sambal oelek). I thought the sauce was going to make it too limey, as it sure smelled strongly of limes (and I love limes! ), but the curry seemed to balance it all out! Omg! So simple and quick to fix. I ended up using different vegetables but it worked out. I didn’t use tofu though. Making this again for lunch tomorrow! Omg I just made this dish and it’s AMAZING! I’m not vegan but I wanted to make a dish without meat and this was a big hit. The sauce made the dish sooo flavorful. I can’t wait to make this again. Thank you! Sooo delicious! Made it with carrots, napa cabbage and zucchini. Love it! Can you show how to make drunken noodles? This was so easy and so delicious! I love the way the lime and curry flavours complement each other. Will definitely make again! Just made this in 20 minutes. Delicious! I omitted the oil and tofu for health reasons as I am following the McDougall plan, and used a bit of water to sautée instead. Definitely going to save this recipe! I decided to make this recipe today. I used brown rice Vietnamese noodles and replaced the peas with mushrooms. Couldnt find the peas in this recipe. But it still came out amazing. So much flavor that I’m surprised i made it. Lol. I forgot to thank you! Thank you so much! I’m planning on trying a new recipe a week. I really want to get better at my cooking skills. Haha. Thanks again! It’s interesting. I am from Singapore and I have never heard of Singapore noodles until I am overseas. This doesn’t seem like any of the noodles I have tasted in Singapore but it does seem really tasty! I am very interested to try this out! I’m pretty sure I ate my own bodyweight of these noodles tonight … amazing! I never leave reviews for anything but feel I must for this: Thank you so much for this recipe, my family loves it. It is the ONLY dish that my very picky 3 yr old asks me to make for her and the only thing I can make for my husband and I to eat for dinner that I can be sure she and my 10 month old baby (!) will always eat too. The kids like it better than pizza, mac ‘n cheese…anything. And it’s so quick and simple! Can I substitute regular sugar for the coconut sugar? Thank you! Other than my vegetarian lasagna, this is the first time I actually make a proper meal. I think I went a bit overboard with the soy sauce, it’s a good thing I like salt. Totally forgot about the tofu so I threw it in the pan for a bit before adding noodles. Turned out almost like fried noodles with eggs, so I’m not complaining. Adding the sesame oil when stirring the paprika, onions and leek smelled so amazing I almost didn’t want to finish it. Definitely gonna try this some other time. Ha! Glad you enjoyed it. Thanks for sharing, Ina! I made this recipe 3 different times this week ? It was that good! I did a tofu version, all veggie, and this last round I made a sesame chicken – all amazing. I am a perosnal chef for quite a few people so I’m always looking for one pot meals that are quick and delicious! I doubled the sauce to make it extra saucey and added it right away to let it carmelize. I also added beets, the stem, and the leaves as well as Swiss chard for extra veg and a pop of color. I also added some sesame roasted cashews since I’m always craving that salty nut crunch with Asian cuisine. Why is that? Anyway, I give this a double thumbs up! ???? Thanks minimalistbaker! O… Don’t forget the sriracha at the end. I made this tonight and it was incredible! The amount of flavor you get from this recipe is insane. This is definitely a new go-to recipe (and so SO much better than takeout). I included tofu and used brown sugar since I didn’t have coconut sugar on hand. My girlfriend couldn’t stop raving about how delicious and filling this was (and she’s a meat lover). 5 star recipe for sure! 1300 mg of sodium? Ouch! 4 tsp of curry powder can’t be right. I used 2.5 tsp with almost twice the veggies/noodles and the curry flavor was way too over the top. Made this tonight, it was incredibly tasty! We didn’t bake the tofu, just fried it and they turned out like little bursts of intense flavour, amazing! MMM soy sauce, lime and garlic, can’t go wrong! I upted some of the sauce ingredients. I looove it. Eating it right out of the pot. Thanks for a vegan option to my favortie take out order! I’m from Singapore and it frustrates me SO much when I see people throwing about “Singapore noodles”, so I really appreciated that you made a little nod to the fact that it’s one of those dishes that you see on chinese food menus that are completely not Chinese at all! oh and I used green beans instead of snow peas, red capsicum, and finely sliced cabbage. Forgot the sliced green onion, and was going to top with bean sprouts but forgot also, oh and forgot the siricha sauce also, still brilliant! Super delicious! Thank you so much for the recipe. Flavorful and just the right kick of spiciness! Yum!! Thank you for the Tofu tip. I can finally stop eating playdoh! Great recipe. I used lemon instead, and turned out great. Dana, Thanks again for another now go-to recipe. My husband and I have made this at least twice a month now since you first posted it. Such an easy to put together dish with incredible flavor and it is so filling but light. You’re awesome! I would definitely replace the shaoxing wine with mirin. I do a lot of Japanese cooking so I always have it on hand. Thanks for the recipe! Thanks for this great recipe! What type of Curry powder do you use? Madras? This was delish! We just put all of the spices (did cut back on the curry powder because ours is hot!) and tamari into the soy sauce and poured all over the veg and noodles in the pan. Just wanted to simplify and make it fast. Have no idea if works for others. Thanks for another great recipe! So so good, my husband and I have made this twice now and it is amazing. We subbed red cabbage for peas and it was such a nice change up. Thank you we love all your recipes. This was so delicious! I subbed kelp noodles to keep it lower carb and I had the perfect meal! This recipe is truly AMAZING. It’s a huge hit in my house. I found it best with wide rice noodles (fettuccine equivalent) the sauce really becomes a delicious glaze around them! I also use whatever vegetables I have on hand, especially broccoli and mushrooms, they really absorb the flavor! Thank you, thank you Dana! Just made this tonight! It was soo yummy! I topped it with some chopped peanuts in addition to the scallions. What a hit! Will be making this again! DELICIOUS!!! I used red curry paste instead of curry powder. I also added some tamarind to the sauce (more like your pad Thai spring roll recipe). Thanks for another great recipe! This recipe was delicious. My husband and I loved it. I added hot sauce bc I like mine spicier. Was surprised how tasty this was. My boyfriend and I just cooked this and ate it for dinner! It was delicious!!! We added shrimp to it and it went together perfectly. I wanted to try it with tofu, but he vetoed that ;) We’ll definitely be making this again! Thanks for the awesome recipe. It took me two tries to really get this down (came down to the right brand of noodles; first were too al dente. Big party hit! YUM! Although I used Hot Curry Powder – should’ve been a bit more sparing with it! Add mushrooms and broccoli instead of tofu – worked a treat. Thanks for another great recipe! I’ve found that if you add a very small amount of fermented tofu (also known as tofu cheese) to soy sauce and mix it well it makes a nice vegan fish sauce. I have made this recipe multiple times, sometimes vegan, and a few times with boneless chicken thigh. I like it with whole wheat spaghetti. This is great straight out of the pan and it also reheats very well. Made it – loved it! I an easy rice noodle dish, and this was it. I doubled it, but maybe that wasn’t necessary because I thought it made quite a lot more than listed. I subbed frozen peas for snap peas (I prepared them ahead of time). I will be making this again, probably adding a bit more vegetables next time. I have tried using tofu in the past and not a fan. I like silken in smoothies. Crisping up the tofu in the oven first transforms it to something that I really enjoyed. i didn’t have snap peas so I added cauliflower instead. I loved this dish! Thank you. Made this without the tofu! I can see now it would have made this meal more complete but it was so good ! This take definitely take a ton of veggies, should have put in more mini bell peppers! It has to be vermicelli, not rice noodles. And not saucy at all, it’s all about the curry powder. Should be nothing at all like pad Thai. A key ingredient is egg, in the same style as egg fried rice, so you’re better off having your tofu like tofu scramble, not crispy. There should be crispiness, but not from the tofu – from the noodles. You need to cook the vermicelli for much longer, not just to heat through, but so the layer of noodles touching the pan starts to go crispy and chewy in places, a bit like with paella rice. This evenings dinner never tasted this good!! Nice quick and easy! Any idea what I can use other than soy sauce? I am breastfeeding my infant with dairy and soy allergies so I have had to completely eliminate the two out of my diet. Not sure if you are still dealing with the MSPI issue but when my wife was we switched to coconut aminos (http://www.amazon.com/Coconut-Secret-Organic-Soy-Free-Seasoning/dp/B003XB5LMU). It’s really good, and replicates soy sauce very well. These were so good!!! Will be a new staple in the rotation! Great friday night meal! I made this twice. Once with teriyaki sauce because I didn’t have soy sauce and once with soy sauce but I reduced the amount of garlic to half. I preferred the teriyaki version and the reduction of garlic in my 2nd try muted the flavours just a tad. Thanks for sharing this recipe. I love singapore noodle but always have to ask for it vegan and cross my fingers that the understand. Now I can make my own. This dish was simply AMAZING!!! 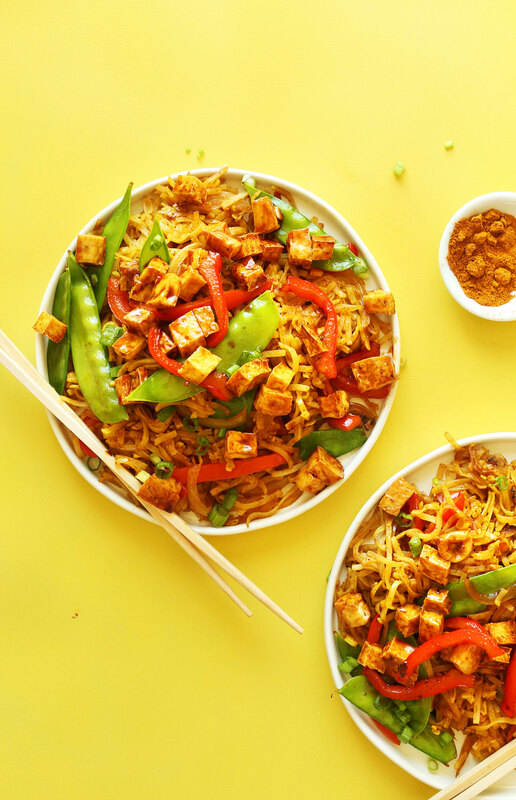 I’ve always loved Singapore noodles and now I’m so excited I can make a vegan version at home. If you don’t want to turn on the oven I’d recommend frying the tofu beforehand then putting it aside while you cook the other ingredients. This was AWESOME. Will make again for sure. Thank you. I love your recipes,im addicted to them!!! I made this tonight…amazing! I have never had this dish before, but the sweet/spicy/tart flavors are perfect. I did add mushrooms and substitute edamame for the snow peas. I can’t wait for my husband to try this! Wonderful! Thanks for sharing, Caroline! Love it! I doubled the sauce recipe as I cheated and used 4 packages of ramen noodles (we keep to a GF diet most of the time, but occasionally I love to use ramen without their yucky flavor packets – I LOVE the noodle texture!) I didn’t have the fresh peas, so I used fresh spinach, frozen peas and the red peppers. I would agree with the post to use peanut oil and add the toasted sesame at the end. My little boys loved it too! Thanks for the yumminess! Those look great, will look out for then at Costco. Thanks for the suggestion! I’m trying this recipe this week and I want to get it right. Do I have to use toasted sesame oil or can I just use regular sesame oil, is there a difference? I believe mine is untoasted, but I’ve also used toasted and it’s very similar (only slightly nuttier in taste). Either way is fine! Fantastic dish! Perfectly balanced flavors and textures. It’s a keeper! I made this dish and it was very good. 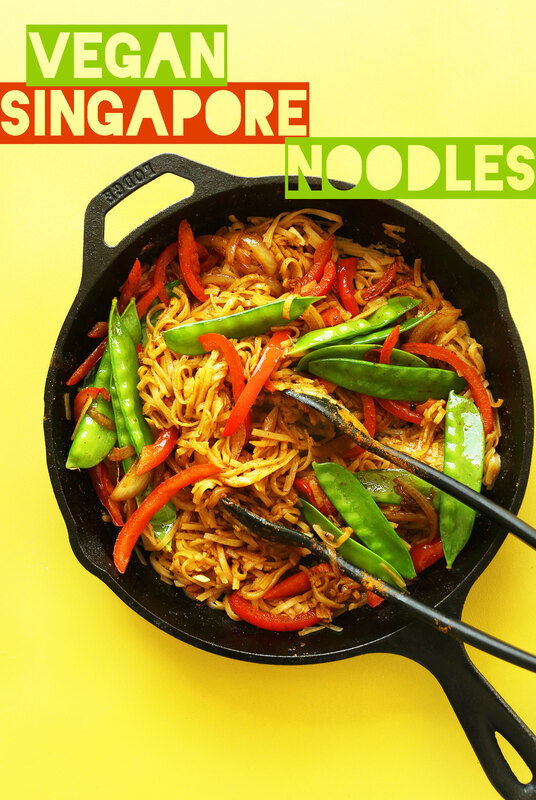 I’ve had Singapore Noodles before and this recipe is different but good in its own right. Next time I would add a little more curry powder. I used roasted chickpeas instead of tofu and followed the directions in her note. Some notes for people making this: If you’re going to double this like I did, use a large pot, not a skillet. “Cook” the Noodles in hot water for about one minute less. I followed the directions on the package and my noodles were a little too mushy since they were also warmed in the skillet. Don’t overcook your vegetables like I did (fault of the cook, not the recipe). Next time I’m going to cook them crisp tender so that there is more variation in texture. Before making this recipe make sure your dishes are done because this is not a one dish recipe (but the results are worth it!). Overall a very solid recipe and I will definitely make this again. I just wanted to share my experience so that others can avoid my pitfalls. Thanks for sharing your experience + tips, Amber! Glad you enjoyed it. I tried this tonight and it was good. One thing though was that the sauce was a little thick which made the noodles taste almost dry. How do I thin it out a little without distorting the flavor? Okay, figured it out. Just added a little bit of EVOO to thin it out before eating and wala! Perfect. Add a bit more oil + soy sauce! This was yummy! The combination of soy sauce and lime is one I’ve done before, but the addition of curry powder is new to me and it is good! No snow peas at the store, so I used a frozen stir fry mix instead that worked well. I also added a beaten egg when combining noodles and veg to add a bit of protein. I like that it isn’t overly saucy, but not dry either. So wonderful! thanks for sharing, Katy! You’re the best, Dana! I love Signapore noodles but had to give them up when I stopped eating meat. I will have to try this recipe! Thank you! Yay! Hope you love it, Cindy! This was delicious! made it last night and it was divine. I tried using fresh rice noodles from trader joes refrigerated aisles and they were awful! (tried 2 batches of the noodles- wouldnt recommend them!) subbed in spaghetti and it worked like a charm. thanks for sharing!! Agreed! I don’t like their noodles either. Glad you found some you liked though! Yay! Thanks for sharing, Trista! My favorite dish from PF Changs is “singapore street noodles” so I am excited to try this recipe. Thanks! YUM! This was lunch today. Dana, you’ve outdone yourself. This was more vibrant than anything I’ve ever had out in an Asian restaurant. So full of flavor. Even looked pretty. And thanks to you, I’ve now bought and tried brown rice noodles. My only subs were sugar snap peas instead of snow peas (all that was available) and mushrooms instead of tofu (had to use them up). Served with a pickled daikon salad on the side. You do us vegan foodies proud! Dana! This looks absolutely fantastic!!!! Ohhh so yummy!!!! I love noodles and this just looks like the ultimate Pad Thai like concoction! A bowl full of noodles is the best! You should create a recipe for cinnamon raisin bread?? Looks better than takeout! You have Singapore calling my name now! Thanks for sharing! Adding some of those to the list! What is coconut sugar? What I can use instead–honey, brown sugar? Yes, you can just use brown sugar! I *do* have most of this stuff, and it sounds really, really delicious. Putting the rest of the ingredients on the shopping list now. Yay! Let me know how it goes, Kelley! Hi Dana, in place of the fish sauce and wine you could use rice wine or vinegar and vegan Worcestershire. It might take the flavour to the next level. Just a suggestion ? What kind of curry powder do you use for this? I did a course in Singaporean cooking and the teacher was adamant that we not actually cook with sesame oil, but rather add it right at the end so it doesn’t get too hot. You might try something like peanut for cooking instead and think of the sesame oil as a finishing flavour. Ooh, good idea! Thanks for sharing! Just made this last night – it was delicious! It’s not exactly like Singapore Mei Fun, in that the sauce is not as dry as what you find in most Chinese restaurants, but in my opinion the sauce is even better. Further, the leftovers don’t dry up into one big yukky lump in the fridge – the sauce keeps them from sticking and they are actually just as delicious on day two! We weren’t able to find snow peas this time of year, so I substituted some thinly sliced chinese cabbage, which worked just as well. Also, we didn’t try the tofu. My 14 year old son loved it, and that’s worth mentioning. I’ll be making this again sometime soon. I love it. I have been feeling bad all day, not able to eat a thing, not wanting to eat. All of that has changed, this looks so delicious. Thanks for the kind words! Hope you love it! Vegan or not, this is SO good with tofu!! I just had this dish for the first time a couple weeks ago and fell in love! Can’t wait to make it myself!! 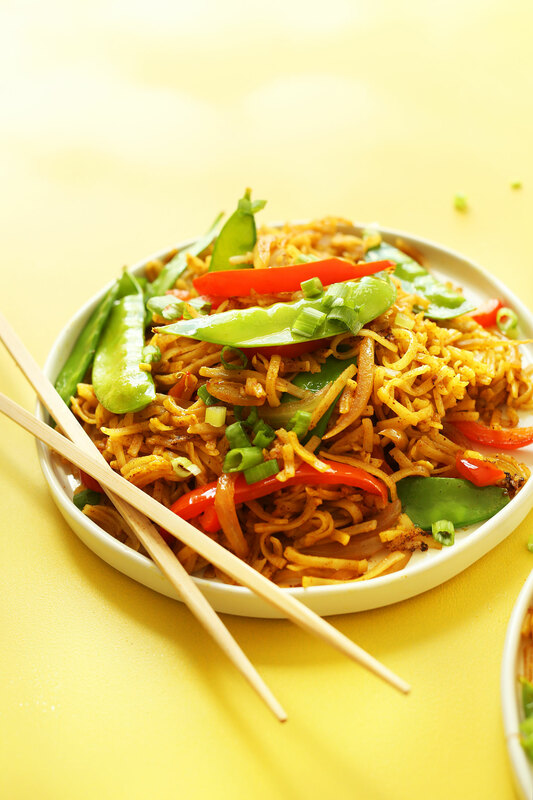 Wow – I used to love singapore noodles – these are perfect and I have everything in – weekend dinner sorted!!! Thanks!!! YES! I always order Singapore noodles when I see it on a menu. In my old town there was a noodle place that would do a sweet Singapore noodle box, theirs was pretty saucy, my husband would mix peanut butter into the leftovers because he’s a nut. Anyway, my favourite thing about this recipe is that I can make it right now without going to the grocery store! Thanks Kiki! Let me know how it goes! I added vegan fish sauce from The Kitchn (www.thekitchn.com/recipe-vegan-fish-sauce-130535) which I always have a bottle of hanging out in the fridge (their vegan fish sauce replaced the one I had been given from a hippie aunt ->less salt and more umami). Even meat and potatoes boy who finds tacos exotic was super into these noodles. Thank you for commenting after you made the food. It’s getting harder to find comment not on thoughts rather than the results of making the food. I agree. When I go to the comment section I’m only looking for feedback from people who’ve TRIED the recipe. I want to know what worked or didn’t and other additions that turned out yummy. Love me a good stir-fry noodle! I lived in Southeast Asia and went to Singapore twice. Food is literally a sport there . You would love it! I have definitely heard of these and loooooove them! Your healthy version needs to appear in my kitchen STAT! Yum! Making takeout dishes at home always turn out so much better and quickly become staples in my house like pad thai. While I haven’t heard of this dish before, I’m excited to give it a try. Well this looks delicious! Those noodles look so yummy and perfect. Yum! Now I know what to do with the tofu in my fridge! looks delicious! Is the flavor of the curry powder prominent? I really can’t stand the taste of curry, unfortunately (I wish I liked it!) If the flavor is strong, do you think there are any spices I could sub for the curry powder–or do you think I could leave it out altogether? Hi there! To me, it seems this dish distinguishes itself from pad thai for instance because of the use of curry powder. I made it yesterday and the curry taste wasn’t overwhelming, but definitely still there. If you don’t like the taste, I maybe would try add the different curry spices you do like and that make up curry powder (like cumin, turmeric, coriander, ginger, chili), and then leave out the spices that make you don’t like curry powder as a blend. If you like all the spices separately but not blended as curry powder, I don’t know how to substitute since the taste of curry powder is so distinctive, but maybe Dana has some other ideas? You’ll be making a different dish then, the curry powder is the point of it. I love these easy and quick to make ‘stir-fry’-like dishes. It looks delicious. I love the colours! I will have to try this soon! My boyfriend’s father is Chinese, so every Sunday for lunch we venture to Chinatown (in Houston) for authentic Cantonese food. When we do noodles, we always order the Singapore noodles. However, here they use green bell peppers, add bean sprouts, shrimp and char siu (bbq pork). I rarely eat meat, but can’t resist good char siu. oh, and vermicelli noodles, gotta be vermicelli and not really saucy, it’s a “dry” dish. These pictures are making me hungry. This looks full of POW! There is really nothing better than slurping down noodles, yum! Perfect dish for a cold fall night (even if the sun is back in New York, I still want some comfort food!) Thanks for the awesome recipe! Wow, you’re doing the whole Christopher Columbia deal here in the exploratory food arena. Love those eye popping red peppers and snow peas in here. One way or another, my wife will make me eat my veggies. We LOVE dishes like this. True story. We almost both got sick we were look at the ingredient list to the sauce we were using for dishes in the same channel as this…..oysters. Ewwww. This looks awesome. Is there anything better than a big serving of noodles?? I didn’t know there were brown rice pad thai noodles, thanks! I’m totally falling back in love with tofu these days too so this is perfect. Ohhh goodness. Between this dish and the Thai basil fried rice Vegan Richa just posted, my husband is going to fall in love with me all over again. He LOVES this stuff. Thanks, Dana!